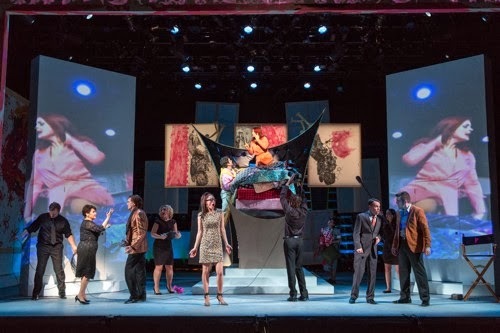 Out of all the smaller opera companies in New York, Gotham Chamber Opera stands the best chance to fill in the gap left by (RIP) New York City Opera. 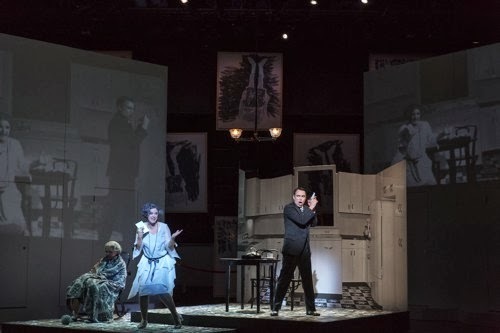 Their new production, Baden-Baden 1927 recreates a quadruple bill that premiered at the titular music festival–four one-act operas by composers Darius Milhaud, Ernst Toch, Paul Hindemith, and Kurt Weill. It’s a great idea and a good opportunity to discover these scores. The production is visually striking. Unfortunately, it’s stronger in concept than execution. Much like their production of Eliogabalo last March, Baden-Baden 1927 features spotty musicianship and a “bold” production that doesn’t make a nuanced case for these interesting pieces. Baden-Baden 1927. Operas by Milhaud, Toch, Hindemith, and Weill. Gotham Chamber Opera at the Lynch Theater (new production premiere). Production by Paul Curran, sets by Georg Baselitz, sets and costumes by Court Watson, lighting by Paul Hackenmueller, projections by Discoll Otto. The most successful of these is the first, Milhaud’s L’enlèvement d’Europe (The Abduction of Europa) set in an art gallery. 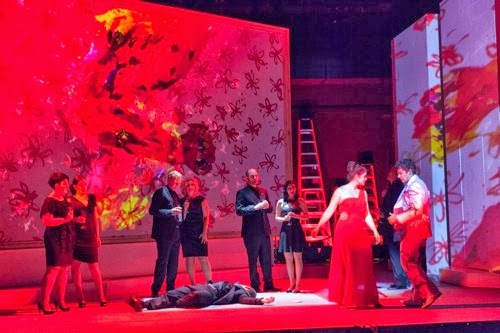 A number of black-dressed chorus members fail to grasp the aim of a big, colorful expressionist painting (the only of the paintings that feels important to the action). Europa, wearing a long red dress, gets it, and is then abducted by Jupiter, whose painted suit identifies him with the painting. Modernist art kills off her fiancé Pergamon. Simple enough. Maeve Höglund sang Europa smoothly if vaguely, Daniel Montenegro sounded strong as Jupiter. As in most of the pieces, the chamber orchestra under music director Neal Goren sounded underrehearsed, and coordination was rough. 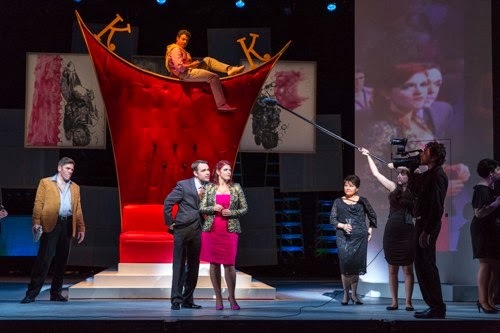 The second opera is Ernst Toch’s Die Prinzessin auf der Erbse, The Princess and the Pea, which is a delightful piece with some fun characterizations and lively music. The characters include the indifferent prince, a spoiled princess, and most memorably the family’s dictatorial queen, who wants to set her son up with a princess at any cost. Curran’s production is set in a Kardashian-like reality TV show. It’s main attraction is Helen Donath’s scream of a performance as the matriarch. She knows how to make the words count. While her soprano is not large, it’s sure. Höglund is better here as the princess, funny and using her clear upper register to advantage. As the Minister, Matthew Tuell does a fine Pete Campbell impersonation. Jennifer Rivera is forceful as the Nurse. While the cameras and hovering production staff give us plenty to watch, the production doesn’t make much sense. The plot’s whole point is that social hierarchy is very important for the prince’s family. The instant fame of reality TV explodes that entire concept. I also have to point out that there is something far more provocative and serious about this piece. It’s by an Austrian Jewish composer, and about a genealogical purity test. Written in 1927. Making if about cheap fame seems to be, er, missing a rather obvious allegory. biggest laughs being people walking backwards. Curran also seems short on ideas for the final piece, the Mahagonny Songspiel. This was a study for Weill and Brecht’s full opera, Aufstieg und Fall der Stadt Mahagonny, six isolated songs on the miserable state of the world. 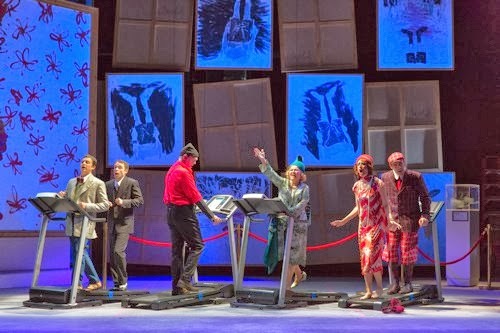 The centerpiece of the production is a bunch of treadmills, whose symbolism is obvious but whose aesthetic presence is somewhat lacking. I’m not sure why a man in his underwear wanders through. (Maybe it’s the Dada. But in Brecht? Really???) Donath and Rivera are effectively smoky in the Alabama-Song and Benares-Song, but the men could use some rebalancing in their quartets. I’m very sorry this evening fell short, because Gotham has an admirable mission and this was a promising production. Zeitoper’s mission to bring topical concerns to opera is hardly outdated–just witness Anna Nicole. But Zeitoper isn’t just about making opera part of pop culture. Its iconoclastic role seems to have been lost: both Anna Nicole and Baden-Baden 1927 seem to view their primary mission to entertain, with any socio-political commentary taking a decidedly subsidiary position. While both succeed to some degree as amusements, this goal is itself disappointingly meek. In 1927, the composers were not nearly so shy. *This may be predictable coming from me but I have to wonder if the addition of a production dramaturg could have made this commentary somewhat better researched and more intelligent. I'm going to see it tomorrow night. Enjoyed reading your comments, but I hope I like it better than you did.